Today is November 11th. 11-11. There are those that believe the meaning of 11-11 (or 11:11) is a sign that angelic beings are close by. They come with love and protection, and they want to bring you clarity and guidance. and a fun opportunity to paint angel wings with glittery numbers and count my many blessings. Love them, even if I did think they were something different at first! LOL! Intetesting Jodi. Wonder if thetre is any relationship about what you wrote about angels bring nearby on 1111 and this being Veteran’s Day? Pethaps the angels that come closer on this day are the former veterans who have lost their llives protecting our country who stll are finding ways (although no longer her physically) to continue to protect us thru their spirit. Know thus might be too hard to develop for this upcomming season, bit it might something to think about in the future. I have never heard that – that is interesting! We need angels to surround us and protect us! Happy 11-11! Beautiful painting! Yes, we sure could use more Angels!! I like the idea of angels beings close by…we need them now more than ever. Beautiful art Jodi..as always. What a lovely thought! You are so creative Jodi! Thanks for the quick lesson on 11-11. Lovely colors. I love your angel wings, Jodi! And what a nice way to honor Veteran’s Day! I didn’t know that. 11:11 is such a cool number. Thank you for sharing this Jodi. The Angel wings are so very beautiful and a perfect choice to commemorate Veterans Day. As a believer, lover and collector of anything Angels – I love the symbolism and know the 11:11 meaning. I do agree that this would make lovely note cards. Thank-you! 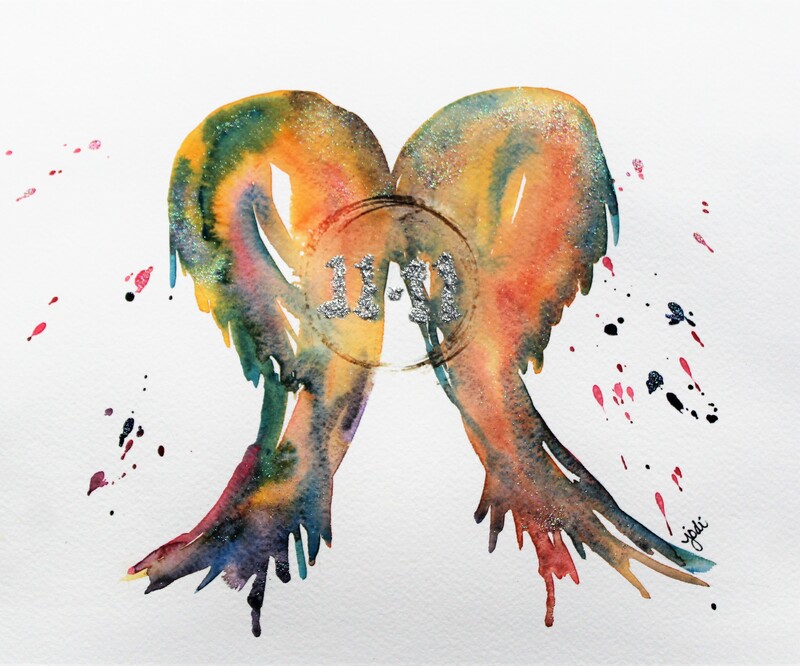 How could only just ‘1111’ be angelic? By stating just these number makes all the other number to go less angelic or devilish. God didn’t create the numbering game, humans did.